FacePress Themeforest тема для community на WordPress. Современный шаблон, с помощью которого Вы можете сделать как свой блог, а также сделать community сообщество на WordPress. Тема современная, новая посмотрите обязательно демо . Тема содержит демо данные WordPress , которые Вы можете использовать для создания демо контента, как на демонстрации шаблона. Thank you for choosing CosmoThemes and purchasing one of our Premium WordPress Themes – your choice is greatly appreciated! Combination of all content types. Enable User following if you wish to have an enriched Author page with data showing posts from followed users, following users and a Timeline. You can use the liquid full-width version or the fixed size layout. Also, you can set different colors for your background and header. Not the least, you can have multiple category layouts: grid view or list view. Let your registered users upload posts directly from front-end. The front-end submission permits users to choose their post format: image, video, audio, text and attachment. Each and every single format can be enabled or disabled. Every registered user can edit his profile from his personal account page which now offers avatar upload, password change and other personal data edit. With FacePress you can create unlimited number of custom posts and assign for them different features: papers, people, locations, portfolios, galleries, etc. Additional info – any text based fields. Let your users login or register without seeing the default WordPress form. Users can also register or login to your site using their Facebook accounts. Enable the “Like” feature to let users raise in rating your posts. When a certain post reaches the limit of 50 likes it will become featured. The like limit can be changed from backend while the number of likes for all posts can be randomly generated. Set your blog main page to display a timeline, widgets, selected posts or dynamic latest posts. It is also available as a static page at your choice. Enable human-time to let users know when the post was added. Switch back to the native WordPress time format from settings. You can opt for the Facebook comments or default, WordPress ones. By default, comments are threaded 5 levels deep. The site uses unlimited sidebars for you to be able to insert as many widgets as you need to get the most of your theme: Categories with icons, Content tabber (hot posts, new, comments, tags), Flickr, Twitter, Latest posts, Social media. 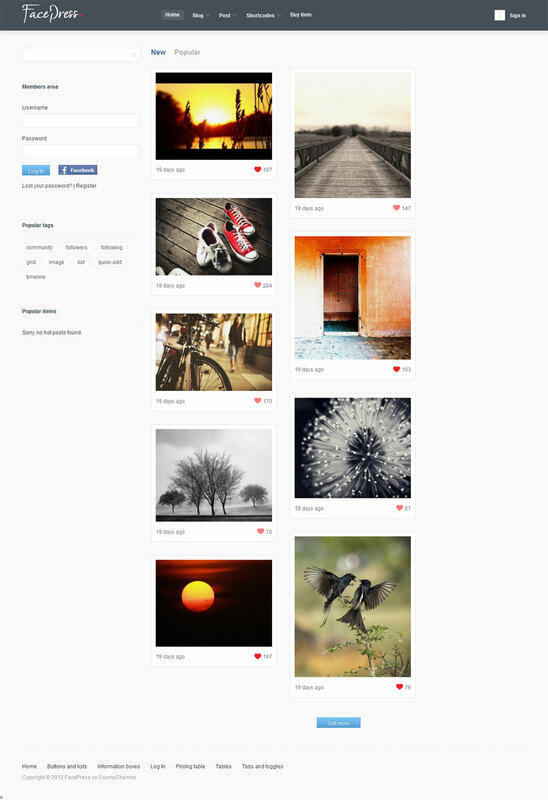 Select a different layout for each of your posts: containing a left sidebar, a right sidebar or displayed full-width. The theme also uses breadcrumbs, dropdown menus, shortcodes, related posts, and comes with an extensive documentation to help you get started. Хочешь новые шаблоны для Wordpress? © 2013 - 2019 Шаблоны Wordpress — InWP.ru , Все права защищены. Скачать премиум темы и шаблоны Wordpress на сайте Inwp.ru. Download premium wordpress themes. InWp.ru – это коллекция премиум тем и шаблонов для сайтов и блогов на WordPress. Нас находят по следующим запросам: шаблоны wordpress, скачать шаблоны wordpress, темы wordpress, скачать тему wordpress, премиум шаблоны wordpress, скачать wordpress, создать блог, шаблон блога, шаблоны блогов, темы для создания сайтов, шаблоны для блогов, шаблон новостного сайта, вордпресс шаблоны, модули для wordpress, премиум шаблоны wordpress, темы для вордпресс бесплатно, wordpress меню, русские шаблоны wordpress, русские темы wordpress бесплатно, русские темы wordpress скачать, скачать бесплатно русские темы wordpress, темы wordpress 3.0, создание шаблона wordpress, wordpress шаблоны 3.0, шаблон интернет магазина wordpress, лучшие wordpress шаблоны, платные шаблоны wordpress, premium wordpress themes, free premium wordpress themes, новостной шаблон wordpress, шаблоны wordpress скачать бесплатно, wordpress шаблоны премиум, премиум темы wordpress, скачать темы для wordpress, скачать бесплатно wordpress, wordpress скачать, шаблоны для блога, шаблон для блога, шаблоны wordpress. С помощью движка wordpress созданы миллионы блогов и сайтов по всему миру.